The Big Wobble: The Piton de la Fournaise Volcano on the French island of Reunion is the 5th volcano eruption around the globe in as many days! The Piton de la Fournaise Volcano on the French island of Reunion is the 5th volcano eruption around the globe in as many days! A week of volcanic activity has climaxed with The Piton de la Fournaise Volcano on the French island of Reunion; joining the impressive and growing list of eruptions in the last few days! The Piton de la Fournaise Volcano is on the French island of Reunion. The volcano erupted on January 31. This video shows lava sprays being thrown into the air during the eruption. A fault was visible on the south-east end of the volcano, according to reports. 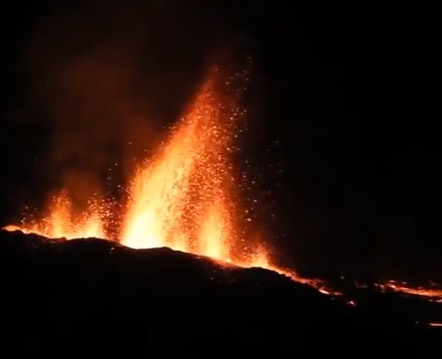 The Piton de la Fournaise Volcanology Observatory said the eruption took place in the Chateau Fort area. It’s been a spectacular week for volcano eruptions with Mount Etna, Costa Rica’s Turrialba, an underwater eruption near Tonga in the Pacific Ocean the Kilauea Volcano in Hawaii and know The Piton de la Fournaise Volcano on the French island of Reunion.